Sometimes a new perspective leads to better understanding. 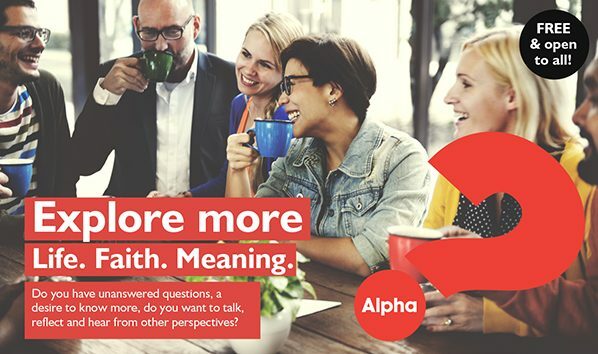 Alpha is a series of interactive sessions to discuss the Christian faith in an informal, fun and friendly environment. The course will consist of nine sessions, looking at topics including ‘Who is Jesus?’ and ‘Why and how do I pray?’ Alpha is for everyone; no question is out of bounds and you are free to discuss as much or as little as you wish. Everyone is welcome. Anyone can raise anything and no point of view is off limits. A lack of Christian knowledge or understanding is definitely OK ! Each session is 2hrs, we start with food and a chance to get to know each other, followed by a talk and an interactive session to discuss what you thought about the talk. There are no right or wrong answers. Do I come to every session? Everyone – whatever background, situation, or experience you bring. We don’t assume any previous knowledge of Christianity. No question is out of bounds and you are free to discuss as much or as little as you wish.